The hotel, Hotel Regina, is located city center and has all conveniences inside and nearby. Its interior is modern with touches of classic features, bar, restaurant with brunch, and fast room service. However, I was a bit taken aback by the size of my tiny interior room. European Hotels are duly known for their "quaint spaces" but this closet with a bed was not my speed; I stayed; it was OK. I don't think I would have made it longer than the few nights because it was an interior room with no natural light because the window faced another interior window. That was a drag. I asked for an upgrade but the lady acted as if she didn't understand. I didn't bother challenging her because I went there to relax. Because the hotel was on the main drag I was able to do a lot of things by foot. I engaged in a lot of people watching, photography, small talk, and of course tapas tasting. I did not visit any museums or historic areas because I simply was not in the mood for such. The weather was excellent so outdoor cafes and strolling through the various plaza were in order. I did one city tour with Madrid City Tours. It's a red double decker bus that circles the city stopping at preselected locations. Tourists are able to hop on and hop off at the stops of their choice and reenter at designated stops. The cost of the tour was 21 Euro. I enjoyed sitting on the top level and just taking it all in. The total trip was about 30 mins not including any stops. Madrid is a quiet city during the day and quite bustling at night. I recommend Madrid for a quick getaway because an extended trip would have become a bore. A weekend with the girls or boys would also be well served because there are ample night spots. I did not see many activities for children but I didn't seek them either. Couples would definitely enjoy the area as love in always in the air. I will visit Madrid again within a couple of years. As always, there are more pictures here. 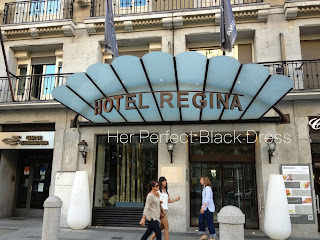 Tags: "ttot", "travel" "Madrid, Spain" "Madrid" "solo travel" "Hotel Regina Madrid"
That hotel looks nice! Looks like you had some great weather too while you were there. The hotel was really nice but my room was so tiny. The weather was fantastic. I wish I could bottle it for year 'round greatness. Living through you right now. Madrid is on my list for sure. Madrid is always on top of most visited tourist places in spain. It has lot to offer to its visitors and can make holidays always rememberable.